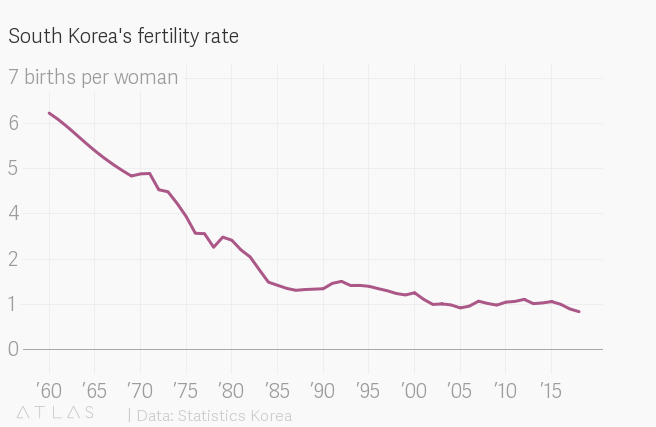 Nothing that the South Korea government is trying to do to stem the country’s plunging number of births is working. The latest data released today (Feb. 27) show that the fertility rate—the number of babies a woman is expected to have during her childbearing years—fell below 1 to 0.98, a new low for the demographically challenged country. That means that only 326,900 babies were born last year in the country of just over 51 million, down 8.6% from the previous year. To keep its population level stable, the country needs a fertility rate of 2.1 births per woman. After also recording a record-low fertility rate in 2017 of 1.05, the government added to its efforts to address its demographic time bomb, for example by allocating more money to the problem and improving parental benefits. This included extending from one year to two the period during which men are guaranteed 80% of their normal wages while on paternity leave. Some local governments are also increasing the cash incentives given to women to encourage them to have even a first child. In December, the government also announced a new roadmap for addressing the root causes of why people decide not to have children, vowing for example to lower the cost of childrearing. It also said it plans to implement measures focusing on improve people’s quality of life rather than simply encouraging women to have more kids, for example by making work environments friendlier for women who want to have children and return to work. The government has also blamed the worsening economic environment for young people as part of the reason why people decide to have fewer children or none altogether. Youth employment continues to rise, while the increase in expenses such as education and real-estate outpaces wage growth. That’s also causing fewer and fewer young people to get married. The number of marriages recorded in 2017 fell 6.1% from the previous year to 264,500, the lowest level since record keeping began in 1970. The 2018 number, which will be out later this year, looks set to be even lower than 2017, with just 230,800 marriages recorded in the first 11 months of the year. 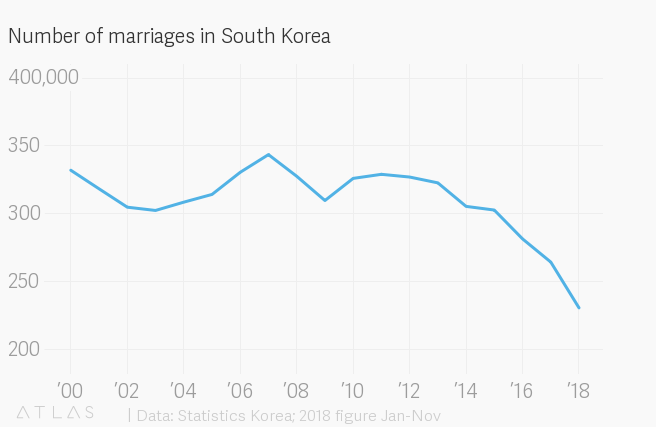 South Korea also needs more children because it is aging faster than any other developed country. The number of elderly people in Korea exceeded the number of young people for the first time in 2016, and the country became an “aged society”—defined as one where the elderly make up at least 14% of the population—at a much faster rate than countries such as Japan or Germany.